10 Months of Declining Tourism - Reversed? By now everyone has heard it. Ten straight month-on-month declines of international arrivals to Vietnam. It is not coincidence that going back ten months brings us to the anti-Chinese riots last May. In fact, I can practically guarantee that the streak will end this June when we start comparing 2015 to the post-riot reality. So is this a tourism problem or is it a Chinese tourism problem? Below is a chart for the last 10 months that shows the year-on-year difference of total international arrivals and international arrivals when keeping the number of Chinese (China, Taiwan, Hong Kong) constant.I also held the number of Russians constant forthe last four months due to the drop in the Ruble’s value, for which Vietnam has absolutely nocontrol. Note: Russian inbound numbers adjusted for Dec 2014-Mar 2015; January and February combined because of Tet holiday. Both lines look bleak, but the change in non-Chinese arrivals looks significantly better. In fact, only half of the 10 months had a decrease. Still, Vietnam’s tourism industry should be doing better. So why isn’t it? I often compare Vietnam tourism to Mexican tourism from the second half of the 20th century. The two countries are incredibly similar geographically and geopolitically; both being the southern neighbor to very large and veryfast growing middle class populations.Mexico’s coastal tourism development came in three stages. Each stage had a distinct type of traveler. The First Generation:Quiet seaside fishing villages like Acapulco and Port of Vallarta discovered by what I call “wanderers”. The wanderer likes discovering places and wishes the place would never change; but in mass, they do exactly that. The outcome is tourism development that never allows infrastructure to catch up, thus making it difficultfor the area to gain a reputation for quality. The Second Generation of tourism development in Mexico was the opposite.Planned mega-resort locations such as Cancun. Walled to keep the tourists in and the locals out, these resorts were perfect for first time American travelers who wanted warm weather and the benefits of third world prices without the third world risks.Second generation resorts turned Mexico into the tenth most visited country in the world. Then American middle class growth slowed and its travelers became more experienced.Wanting more than just a beach, the newest generation of tourists to Mexico expected a unique, quality experience. This customer gets more upset about a bad experience and wasting their valuable time, rather than their money. That does not necessarily mean they are rich, but rather have a good understanding of what they want and what their options are. Niche tourism is another phrase for the same thing.It is tourism designed around meeting specific purchase considerations for a small segment of a market. Mexico’s third generation businesses leveraged the ancient Maya ruins, jungle excursions, and high-end yachting along the coast. Where Does That Leave Vietnam? Vietnam’s tourism development is just starting its second generation. Places like Vung Tau,PhanThiet and NhaTrang are first generation locationsalready over-developed for the infrastructure.Sapa is rapidly following.Even Saigon and Hanoi are incredibly difficult to access for travelers, especially the inexperienced. Walking is incredibly frustrating and public transportation doesn’t exist. Getting on Highway 1Aendangers your life and the trains are 50 years old.Backpackers and other wanderers have been coming to Vietnam for decades and the hassles and obstructions are welcomed since they help keep others away. One backpacking website even listed “crossing the street” as one of Hanoi’s big attractions. Vietnam is still an excellent place to visit for the wanderers but not so much for experienced travelers who have moved on from the adventure of not getting robbed or cheated. The second generation of tourism development has begun.Danang has a strip of second generation resorts and Cam Ranh is following a few years behind. Before May 2014, Danang was beginning to fill up with China’s rising middle class and NhaTrang could not contain all the new Russians.Unfortunately for the investors in these projects, the Vietnamese government is doing what they can to keep first-time international travelers away. I receive a weekly newsletter called China Tourism Update which usually has ten headlines about countries making it easier for Chinese visitors to visit, and another five about how large and fast growing the Chinese outbound market is. The Vietnam government is the only one in the world that is trying to make it more difficult for them. I can only assume then, that the clamor in the press from experts is about Vietnam being unable to increase the number of third generation tourists – the experienced travelers (mostly European, North Americans, and Australians) who have the money to spend but choose not to use it on Vietnam. The Vietnamese Government focusing on 3rd generation tourists is like climbing to the top of a coconut tree for a small coconut when a giant coconut is lying on the ground with a straw sticking out. However, if the government is intent on bringing more Europeans, North Americans, and Australian non-backer tourists (i.e., 3rd generation) instead of simply welcoming mass amounts of Chinese, then it had better do something quickly and correctly. Many of the best locations like Sapa have already been destroyed due to a lack of planning; at least according to one newspaper. Smart and efficient use of resources could turn it around, but it is more likely to get a cable car and amusement park than proper waste collection and treatment facilities. The Vietnamese provincial governments would rather not develop the Son Doong caves into a high-end natural wonder accessible to people who really care about that type of exploration. Instead, they plan is to build a cable car which allows mass amounts of people (and trash) inside; thus spoiling the attraction for those who really care and would spend the money to make their experience amazing. Rather than refurbish the beautiful old French buildings on BaNa hills and create a unique, exclusive and quiet hillside retreat, the Vietnamese developer chose to build a fake plaster French castle with a loud arcade. As a country, Vietnam simply doesn’t have the expertise or inclination to understand what it would take to move quickly past the first and second generation. Hopefully the eventual profits of a large number of Chinese visitors can be used to upgrade infrastructure and preserve locations for the third generation of visitors that might arrive later. Quite honestly, I believe Vietnam should focus on first-time travelers from South Korea, China, Russia, and later India. Nearly all of its marketing budget should be spent in China. China is the best fit, it is the largest, and it is the fastest growing. Instead, Vietnam does everything they can to make the Chinese feel unwelcome but nothing to make experienced travelers want to come. Making the visa process more costly and complicated for these new international travelers is the exact opposite of what the competition is doing. Every international investor in Vietnam is counting on this market rebounding. Make Chinese feel welcome and they will come back. At the business level, it is still possible to target the 3rd generation market. Next month I’ll discuss some of those businesses who have done it or doing it now, plus one Vietnam province that still has a chance to become a 3rd generation destination. Last month I wrote that Vietnam’s government should focus its entire marketing and products towards Asia’s new middle class travelers because a government’s mandate is to maximize employment, income per capita, and foreign direct investment. If you have any doubts about this strategy, take a look at the chart below. Vietnam is geographically in the center of an area with the largest growth in disposable income in the history of the world. 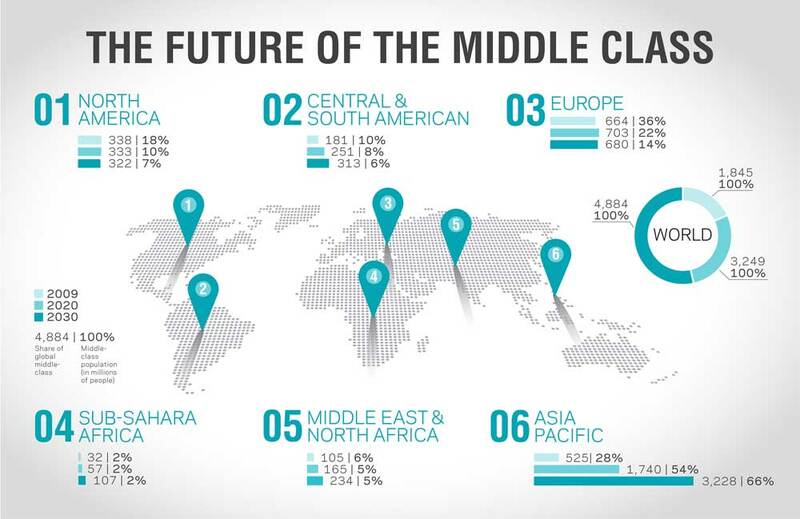 Each new middle class person is a potentially new international traveler. To spend the country’s resources chasing after mature markets is a waste of time and money. Creating a cumbersome and expensive visa process is a huge barrier for these new travelers. That being said, if you own or manage a business dependent on tourists, it does not mean you have to chase these new Asian travelers. You just need to understand you are swimming upstream against a pretty strong current that will not change anytime soon. So a 1st generation location means infrastructure and controls have not caught up to the exploitation. It also means you can give your customer the best 3rd generation experience in the world, but as soon as they step out your door they are back to 1st generation. For example, Park Hyatt may have 5-star service, but trying to walk across the street during rush hour will dampen anyone’s enthusiasm. For the most part, visa hassles are not keeping the experienced 3rd generation traveler from visiting or returning, it is the other typical complaints about the country you see in the blogosphere. And it is not going to change anytime soon. So what are your options? 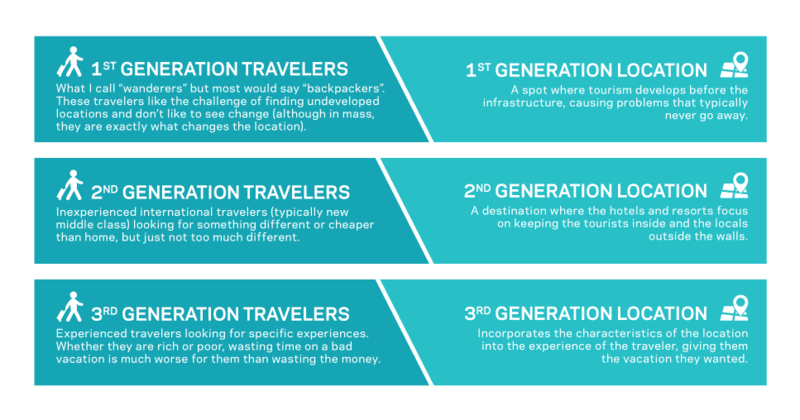 First, you can accept the fact that most of your business will come from 1st generation travelers (i.e. backpackers) for whom you’ll mostly compete based on price. Alternatively, if you happen to have 40 hectares on the beach near an international airport, you probably wait until the Chinese return. The third option is to try and carve out your own niche, understanding you are competing against businesses in other countries and your business is at a disadvantage. Is the third option possible? Yes – several business examples exist. The first thing to do is identify a market niche – a segment of the market that has very specific purchase considerations that your business can satisfy. Then do everything possible to make sure that customer’s experience is even better than they expect. Aman Resorts’ Amano’ iResort does exactly that. The rich and famous quietly come to Vietnam and spend days sequestered on Vietnam’s nicest coastline at a tune of up to thousands of dollars per night. Private butlers, chefs, and spa staff take care of their every need. Next, try and minimize your guests’ exposure to the negative aspects of being in Vietnam. Victoria Hotel and Resorts used to do this by finding beautiful but relatively unknown locations for their resorts. 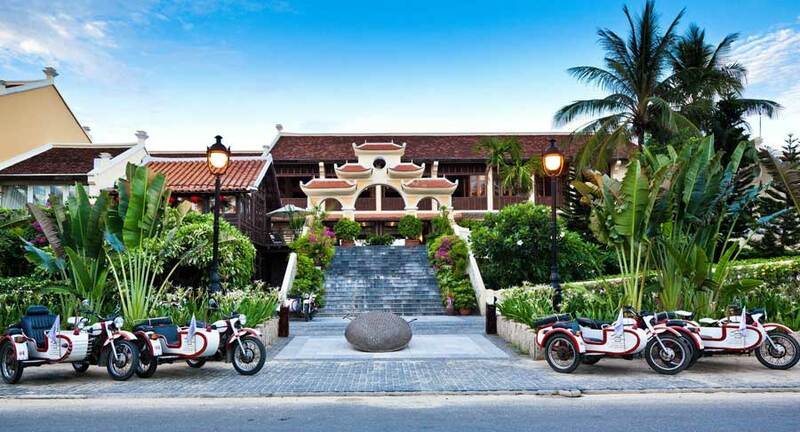 They were among the first high-end resorts in Sapa, Phan Thiet, Hoi An and Siem Reap. With a colonial atmosphere in places without the typical tourist hassles, middle class travelers from Europe found the Indochine experience they expected. Another way to reduce the negative impact of 1st generation locations is to extend the length of time you have influence over your guests’ experiences. For example, make sure to call only reliable taxis to pick up at your place. Pass on information about great service providers at their next stop. Nearly everyone who comes to Vietnam moves from place to place. Find other businesses that are targeting the same niche market segment as you and try to find ways to cooperate rather than compete. So are there any potential 3rd generation locations left in Vietnam where the provincial government may support this type of tourism? One province is at least trying. Ninh Thuan hired outside consultants in 2010 and developed a plan around high-end tourism rather than mass tourism. Adequate infrastructure has recently been built before its discovery by international tourists. It has a long undeveloped coastline accessible for the first time because of a new extensive road project. Ninh Thuan also has one of Vietnam’s largest national parks (Nui Chua). The province even assigned a non-Vietnamese company to manage the park’s water sports to minimize chaotic development. Land allocation has generally been in the two to ten hectare amount which is best for smaller and medium sized resorts targeting smaller market segments, rather than the huge lots of land developers received in Cam Ranh and Danang. It is still early, though, and a lot could go wrong. Most local businesses will continue competing on price and provide bad service and ruin the country’s reputation. Help won’t and shouldn’t come from the Vietnamese government; instead, the government should be focusing on how to lure the new Asian middle class to large, 2nd generation resorts. Notwithstanding one or two locations, if Vietnam has any chance to compete against its neighbors for wealthier and more experienced travelers, exceptional services must come from the private business sector. 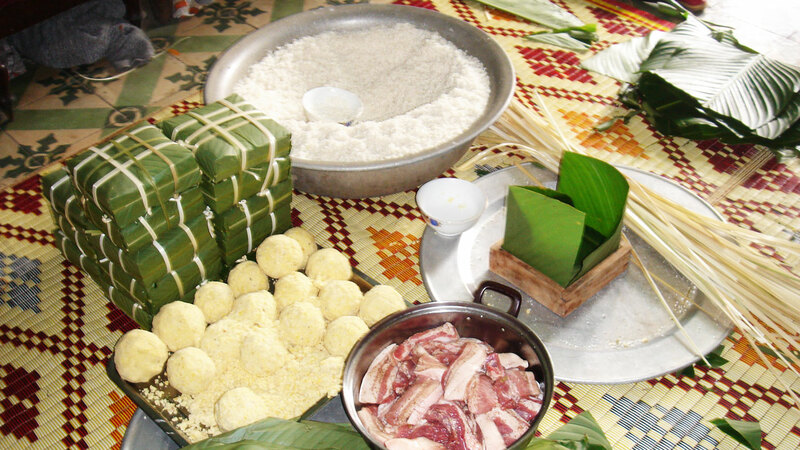 "Analyst Mark Gwyther tells the latest about the recent trends in tourism in Vietnam. With all of the changes this unique city is experiencing over the years, whether it be construction, increase in foreign residents, or business growth, tourism by far is one of the leading developing changes this country is encountering." As we flip our calendars to 2015, it is a perfect time to look at the past twelve months and see if any trends can be identified to help guide us in the future. Last year was a very strange year for the tourism industry in Vietnam. During the first four and half months it figured to be a huge year, with an upwards growth of 25%. Then the unpredictable East Sea crisis and the drop in value of the Russian Ruble set everything on its head. Instead of the 9 million international visitors some were predicting , only 7.8 million people came to Vietnam. Those various events greatly affected the data. Removing China, Taiwan and Russia and then grouping countries into different regions provided some clarity. As an analyst, I am always looking at growth rates for comparable time periods. 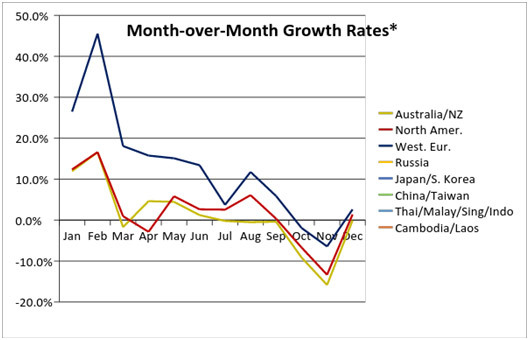 Rising growth rates are particularly exciting. 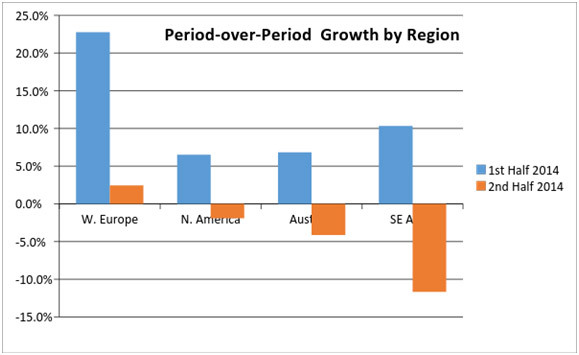 Unfortunately, three of the largest regions revealed a negative trend line in period-over-period growth. All three regions had fewer arrivals for much of the second half of 2014 than the year before. * The growth rate from each month in 2014 versus the same month in 2013. From the data, it is obvious the Chinese and Russian markets dipped in the 2nd half of the year but it is disheartening that the three regions shown in the graph experienced delayed growth as well. This should be very worrisome to the tourism industry in Vietnam. The graph below shows the stark contrast between the growths in arrivals (growth versus 2013 for the same period) from the first half of the year to the second. Even the other Southeast Asian countries followed this trend to further exacerbate the issue still excluding China, Taiwan, and Russia. At this point you probably expect an analysis of why growth halted nearly across the board sometime in early summer. But some of you may have noticed an omission in the data above, and that is the most significant trend in Vietnam tourism. One very important positive aspect can be found in the data from 2014: the increase in visitors from northern Asia. The number of visitors from Japan and South Korea increased by about 135,000 last year. 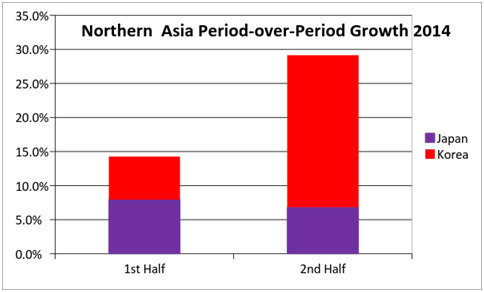 More importantly, the northern Asia region showed very positive growth in the second half of the year. After digging deeper into the data I found that Japan’s first and second half rates were about equal. On the other hand, South Korea’s increased by 22% in the final six months. That is not an insignificant amount of people, either. South Korea is the 2nd largest market in Vietnam, trailing only China. Businesses in Mui Ne and Nha Trang might be surprised to know that over twice as many South Koreans come to Vietnam than Russians. This is not an anomaly. From prior research, it was found that people normally begin traveling internationally at an income level of about $1,500 USD per month, or $18,000 USD a year. South Korea’s per capita GDP surpassed that amount in 2006 and has steadily increased to $23,900 in 2013. That means a significant amount of South Koreans began traveling internationally in the past few years and, if the trend follows, every year there will be many more traveling abroad for the first time. Vietnam is close, cheap and warm in the winter — all excellent attributes for return visitors. From my knowledge about the market, South Koreans come to Vietnam for a variety of reasons, whether it be cultural, weather-related, or for purposes of leisure, such as golf, shopping. Here in Ninh Chu Bay, for example, South Koreans come to enjoy kite surfing. If you are in the tourism business in Vietnam, it is advisable to adopt a South Korean strategy to appeal to this increase in tourists. One day, toward the end of the year, the emperor met with all his sons. He told them whoever brought him the most special and unusual food would be made the new emperor. Almost im/mediately, the princes left for their homes and started looking for the most delicious food to offer the emperor. 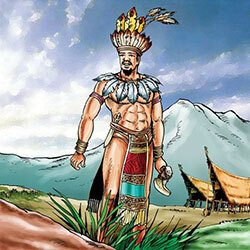 Some went hunting in the forests and brought home birds and animals which they prepared into the most palatable dishes. Some others sailed out to the open sea, trying to catch fish, lobsters and other much loved sea food. Neither the rough sea nor the violent weather could stop them from looking for the best gifts to please the emperor. 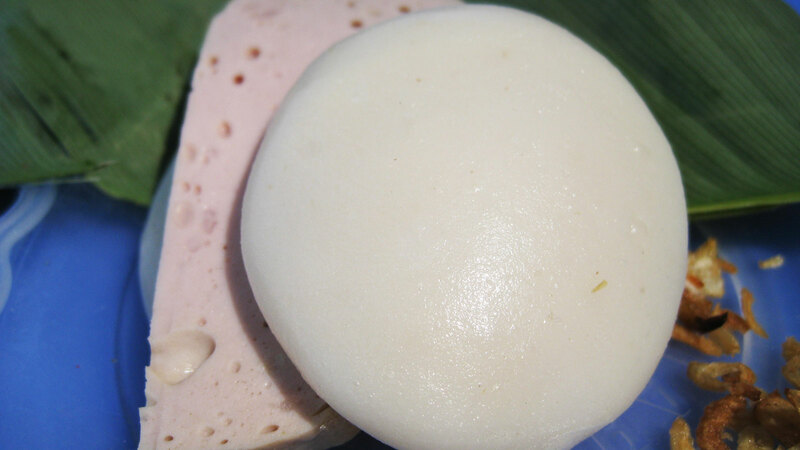 Banh Day. Credit: Nguyen Thanh Quang, Wikipedia. Last month I wrote about the increasing growth of South Korean inbound tourists in the 2nd half of 2014. Since that time, VNAT released two months of inbound statistics and the trend has not only continued, but accelerated. The rate of growth for January and February (versus same period in 2014) was 41% and 68% respectively. Even more interesting, February was the first time on record the Chinese were passed for the top spot in inbound arrivals. A day or two after writing my first article on South Korean tourism, I found myself lamenting the fact that the Russian Ruble shed half its value the same week my team and I opened our beach bar and restaurant. Right then I made the decision to follow my own recommendation and come up with a South Korean strategy. The results have been remarkable. Granted, most hospitality businesses are different and have their own unique challenges, but I figured it may help to share my experience over the last month nonetheless. As a business owner on the South Central Vietnam coast, a lot of our business plan was focused on the Russian market. This changed a month ago. We are now probably the world’s first Korean kitesurfing reggae bar and restaurant. Easy, quick adjustments were made. Facebook and social media posts became translated into Korean. While English is a required subject in South Korean schools, it isn’t often used in society and is often forgotten in the years after graduation. Additionally, just the fact that a business is trying to communicate in Korean signals a welcoming attitude that could differentiate you immediately. Next, we took a look at our menu options to see if they matched the Korean palate. It did not. No wholesale changes were made, but our daily specials now all focus on the Korean market. For example, our weekly burrito special is now a kimchi fried rice and chicken burrito. Octopus replaced squid. Korean spices and condiments are now added to other dishes. After the adjustment we were ready for Korean customers. The search began by looking for the local Korean operators bringing South Koreans to travel to Vietnam, and then simply introducing our place. Facebook is an easy way to keep your demographic informed. Being a relatively new operation, we were given the flexibility to provide custom service to the groups who started coming in. Finally, we changed our policy from having our employees study Russian to practicing Korean. Just a few simple words like “thank you,” “hello” and “goodbye” spoken in Korean creates a great impression. More significant changes will follow. A Korean/English/Vietnamese menu is in the works. The new menu will include a few adjustments to the dishes and the addition of soju to the drink list. Finding staff that speaks Korean is also on the agenda. This should not be as hard as it sounds as many people in Vietnam have worked for Korean companies or perceive studying Korean as an opportunity to find a good job. With 4,000 established South Korean companies in Vietnam, Korea is the country’s largest foreign investor. Korean pop culture influence on the younger generation may also increase the number of Vietnamese youth who study the language. Now that South Koreans are aware of our business, the next step is to influence more of them to choose our location when planning their next trip. We already started the process of hiring a social media manager in South Korea to promote us. South Koreans use the internet more than any other nationality in the world, so this is a critical step to growing our business in the long-term. Obviously the steps outlined above will not work for every business, but those waiting for the Russians and the Chinese to return need to reconsider their business plan. We did and are very pleased with the results. If you purchase expensive products during your travel in Vietnam, it is very easy to get a VAT refund if you follow our instructions below. 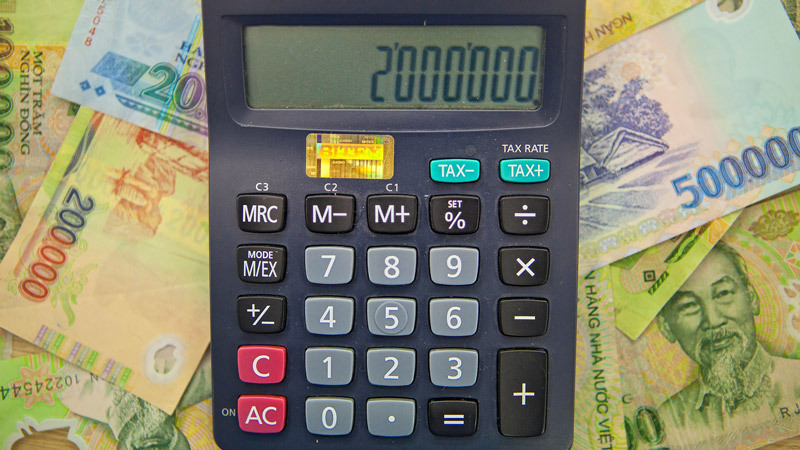 A pilot programme was implemented in 2012 at Noi Bai and Tan Son Nhat International airports which allowed foreigners to receive VAT refunds in Vietnam. As of early March 2015, the VAT refund to foreigners programme has expanded to seven additional exit terminals. - Phu Quoc International Airport. **VAT refunds are only applicable to goods brought along by foreigners when they exit. For the seaports, refund is only available if the ships go directly abroad from the ports. Keep in mind these ship voyages only occur 3 to 4 times a year. 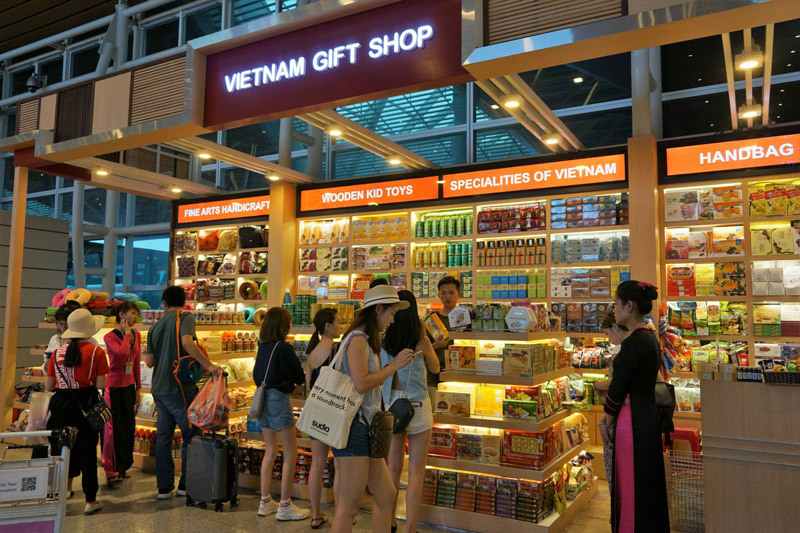 Foreigners are entitled to obtain a refund that accounts for 85 percent of VAT on eligible goods that were purchased at VAT refund shops during their travel in Vietnam. The remaining 15 percent will be counted as service fees. In other words, this is an opportunity for foreigners to get back some of that hard-earned cash by buying goods at shops that offer VAT refunds. - The purchased goods must be subject to VAT, unused and allowed on an aircraft. 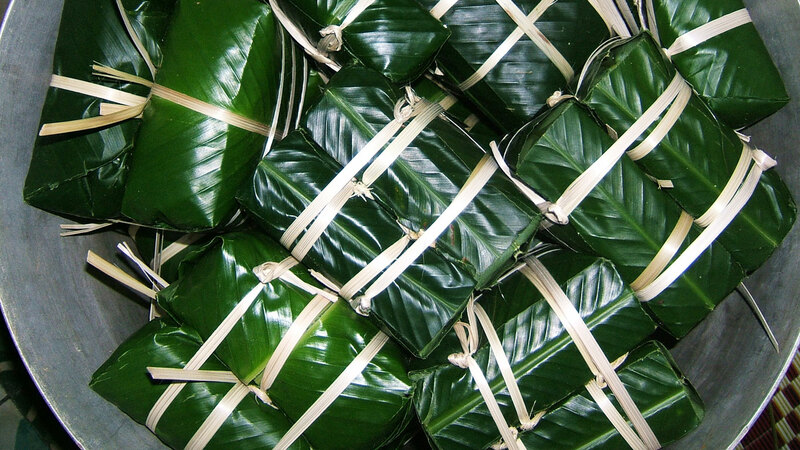 - The purchase goods must not appear on the list of export prohibitions or restrictions. - Purchased goods must have invoices and VAT refund declarations issued within 30 days of departure. - The purchased goods must be bought from a single shop in a one day duration and must be a value of at least VND2.000.000 (around US$100). 1) When purchasing goods, you must submit your passport to the retailer so they can create the VAT refund declaration form. They will issue you an original copy but make sure to check that all your information is correct. 2) Once you are at the airport, head over to the VAT refund customs inspection office where you will need to present the goods you have purchased, your passport along with the invoices and VAT declaration form. 3) Once you’ve taken care of all the paperwork to get your declaration form, you will need to submit a boarding pass from an international flight and invoices along with your VAT declaration form to the VAT refund counter. This is where you will receive your refund. It will be in Vietnamese Dong so you will have to head to a currency exchange. 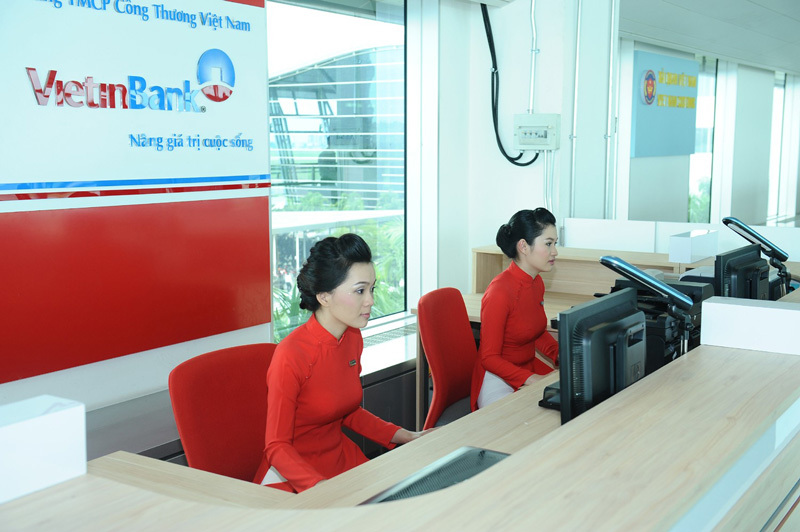 At Noi Bai, there is a Maritime bank and Vietcombank while you will find BIDV and VietinBank exchanges in Tan Son Nhat.